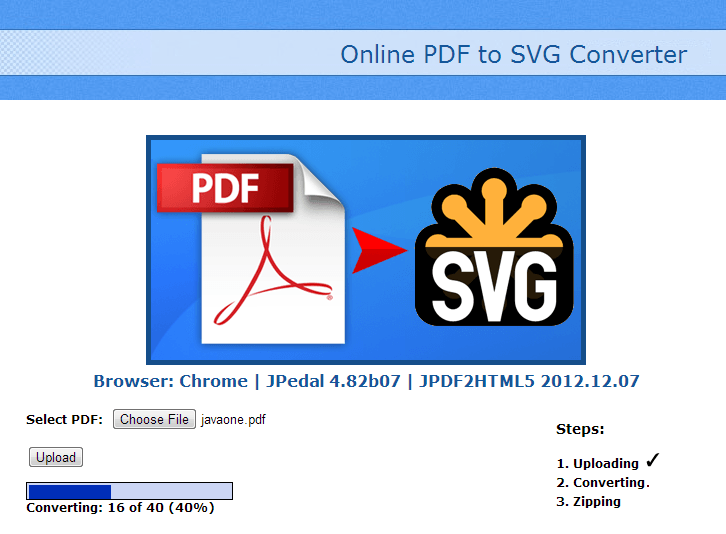 To make it easy for potential customers to try out our PDF to SVG conversion, we have decided to add an online PDF to SVG converter to our range of online PDF tools. The service is currently free and can be accessed here. Simply upload a PDF file, and wait as the converter progresses through the pages and then provides links to view online, or download the converted files. If you want to learn more about PDF to SVG conversion, it is included with our PDF2HTML5 tool which you can learn about here. We also do lots of other things with PDF in Java, many of which you can try online by going to our online PDF tools page. The online tools are designed to offer a demo of the functionality they provide. If you want to get all of the features, we recommend you consider buying the software!